I’ve been trying out the test version of Picasa that publishes web albums and lets you geotag photos with Google Earth. I imported some photos of Stockholm, geotagged them, and published them as a web album. I’m completely impressed. The process manages to combine absolute ease of use with all the power that Google Earth now musters. It took me no time at all to pinpoint seven photos to within a meter’s accuracy, and I found myself smiling at the ingenuity of it all. Here’s how it works: Start with some imported photos. Highlight them. 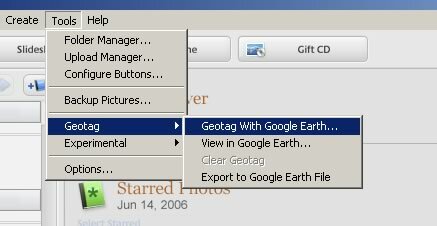 Go to the Tools menu, select Geotag > Geotag with Google Earth. Google Earth pops up with big crosshairs at the center of the screen. At the edge of the screen, a floating window that shows you the photo you need to georeference. Drag the Earth. Click. Next. Repeat until done. Placemark icons are generated automatically from the image, and the collected whole is turned into a folder ready for export as KML. (Here is the KMZ file of the Stockholm photos.) Once Done, Picasa marks the photo icons with a small symbol, denoting that they have been geotagged. Publishing them to a web album is just as seamless. Push a button, log in to your Google account, choose a name and whether your folder is public, and you’re done. in fact, once you have a Picasa Web Album account, you don’t even need the Picasa standalone application. You can upload photos directly, via the web client, albeit without Picasa’s georeferencing abilities. There is still room for development, of course. The public web albums do not yet offer up a KML link for georeferenced photos, and the RSS feed that accompanies the photos does not do GeoRSS. Integration with Google Maps would also make sense, in case you’re travelling and want to georeference your roadrip pictures. I’m sure it’s just a matter of time. The integration between Picasa and Google Earth is the first instance I can think of from the past year where Google develops something geo-savvy that risks competing with the freelance developers in its ecosphere. There are other tools out there that use Maps and Earth to georeference photos, mainly connected to Flickr, but also dedicated ones, like Panoramio. (Panoramio’s strengths lie elsewhere, though — in social mapping.) In this case, however, the advantage of the ease of use of the integration is so great, that anyone using Google Earth should download Picasa, and anyone with Picasa should download Google Earth. And that’s precisely how the game is won against Microsoft and Yahoo!. Pictures tagged by Picasa will have embedded coordination, and then when uploaded to Panoramio it will recognize the location. So easier to locate pictures on Panoramio, and then see it all back on Google Earth using the network link. I saw that, and I like it very much. I think Tagzania and Panoramio should merge, call themselves Tagoramio or Panzania, become a Basque software powerhouse and take over world. I’m only half kidding. I put down a few interesting thoughts on my blog about the potential future evolution of Google Earth into a Reality as a Service (RaaS) application. No, I just applied for it when it was announced, and waited for the invite. It’s a public test version. This looks really neat. I’m waiting to get an invite to download Picasa so I can try it out. Well, I finally got my Picasa invitation, and uploaded several pictures that contained latitude and longitude info in the EXIF tags…Picasa did not seem to recognize them! Worked great (and automatically) in Panoramio, by the way. You don’t need a picasa web invitation to download it and install it. Here is a blog post on my site that shows how to use Google products and WWMX to geotag photos using track information from a GPS device. 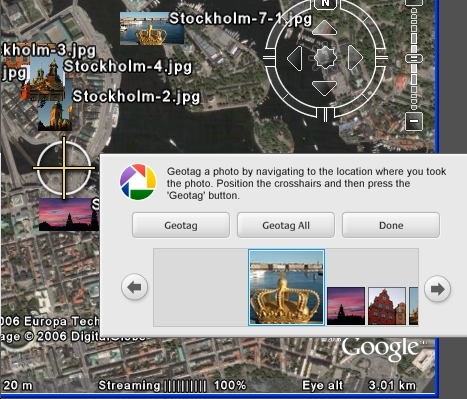 It also shows how to view this GPS data and Geotagged photos in Google Maps and Google Earth. I then use Blogger to publish these geotagged blog posts. Estoy georreferenciando unas imágenes en el google earth a través del programa picassa. Para ahorrar tiempo, lo hacíamos dos personas de distintos ordenadores. Los dos ordenadores están conectados en red y trabajamos contra una misma unidad. Todo salía bien, hasta que hace una semana, nos encontramos que las que se georreferenciaban en uno de los ordenadores no aparecía en el otro como georreferenciado y así mutuamente. No sabemos cuál puede ser el problema, ya que siguen conectados en la misma red. I wonder if this will help Search Engine Searching in any way for website findability.